Did Jeffrey Dean Morgan just confirm the TWD theory that there are two victims? It’s been a tortuous few months since The Walking Dead‘s Season 6 finale left fans in the lurch with a major cliffhanger — the sound of nefarious new villain Negan beating one of Rick’s OG crew to death with his barbwire-covered baseball bat, Lucille. It wasn’t an entirely surprising situation, considering a very similar scene plays out in the comic series by Robert Kirkman the show is based on. In that sequence, fan favorite Glenn is the one to go. But still, knowing what was coming did little to lessen the blow (pun unfortunately intended). I certainly don’t want to say goodbye to Glenn anytime soon — aside from the devastating impact that would have on Maggie, I just like the guy, if we’re being honest. He’s chill AF, loyal to a fault and his character has been one of the driving forces of this series. So it’s with great reluctance that I consider the rumor making the rounds online. According to the fan-centric celebrity gossip site Oh No They Didn’t, fans of The Walking Dead are convinced they’ve figured out who got Lucilled in the season finale. And, sadly, it does look like our hero will indeed go down the same way his death was foretold in the comics — Glenn shall die by Negan’s gnarly bat, if these sleuthing fans are to be believed. But wait, it gets worse. That’s not all the fans are saying. Not only do they feel certain Glenn dies by Negan’s bat on that fateful night, but they also claim another cast member will be killed: none other than everyone’s favorite mustache-sporting, one-liner-slinging roughneck, Abraham. Say it ain’t so! We can barely stomach the thought of losing one of Rick’s crew, much less two. But unfortunately for us fans, the rumors might actually have some truth to them. In an interview with Den of Geek, Jeffrey Dean Morgan (Negan) hinted at multiple deaths, saying, “Negan’s not just going to kill one person in [the premiere]. He’s not afraid of bashing in skulls.” But what does this mean? Is he referring to two people in Rick’s crew or someone else? Anyway, back to the theory. Reportedly, fans determined the deaths by process of elimination. Actors Michael Cudlitz (Abraham) and Steven Yeun (Glenn) have not been seen on the set filming since the first episode of Season 7. Every other actor has been seen, however. 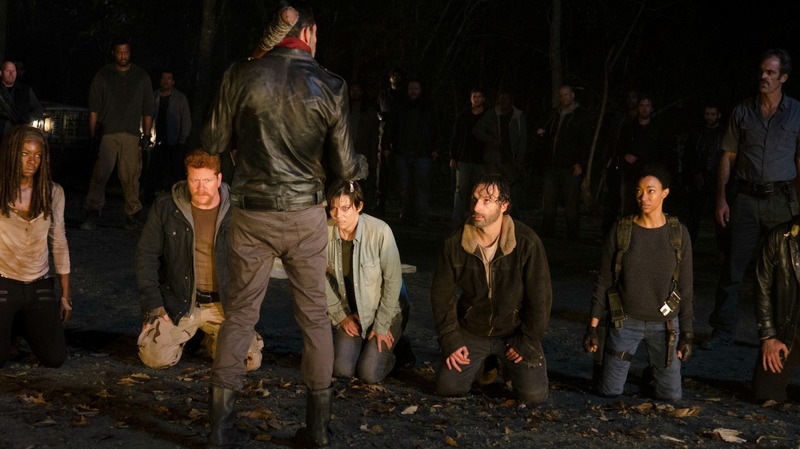 Since that episode would presumably be the continuation of the Season 6 finale and thus the episode we see whose skull Negan is crushing, it stands to reason they wouldn’t need to film beyond the Season 7 premiere. The rest of the cast has apparently filmed at ASZ, Hilltop, the Sanctuary and the Kingdom with no Cudlitz or Yeun in sight, so spoiler trackers are confident in their assumption. Here’s the thing, though. Would it really be that easy to figure out such a huge part of the story arc for Season 7 (and, for that matter, the entire series)? We know AMC and the producers have gone to great lengths to conceal integral plot points from fans before. I interviewed the lovely Lauren Cohan, who plays Maggie, earlier this year. During our conversation, she discussed the incredible lengths the show goes to in order to try to keep the show as unspoiled as possible. At times, the cast quite literally has to hide away from the world. So, call it denial if you want, but I’m not going to believe both Abraham and Glenn die until I see it play out when the series returns on Oct. 11. Until then, I’m going to assume only one of them goes (uh, sorry, Abe!) and the other is just tucked somewhere away from prying eyes. What about you? Do you believe this devastating fan theory?